We often neglect it, but a helmet is an essential part of welding. It protects our eyes and face from the radiation, flying debris, hot sparks of the welding work. 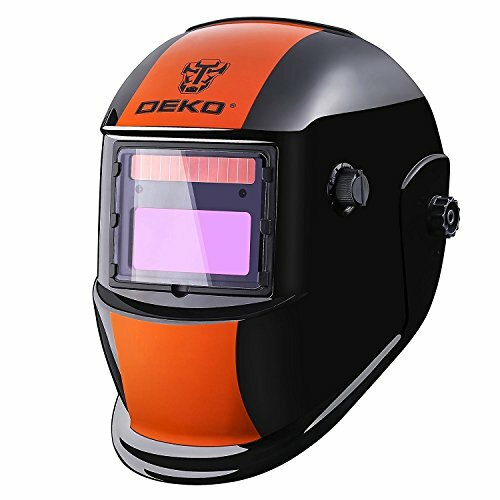 But not to worry as Dekopro is at your service with a wide range of welding helmets. 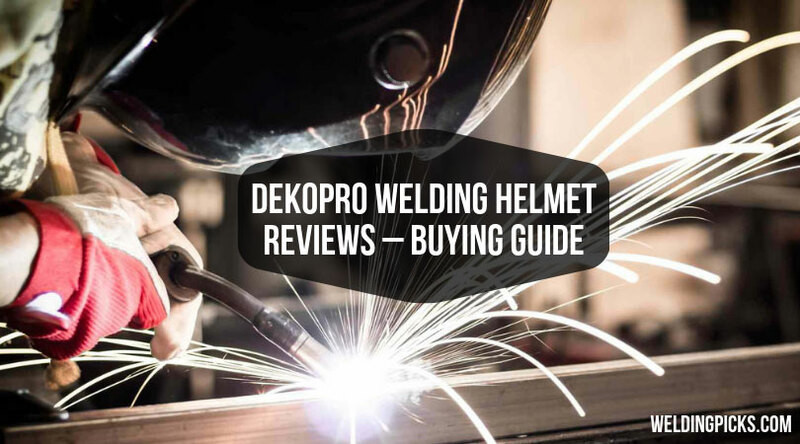 For your ease, we will discuss a brief of the top 4 Deko Welding helmet review. After going through the article, you should be able to select your desired one according to the work need. 3.1 How do you charge when the battery is low? 3.2 Where can I get replacement lenses? 3.3 Is the lithium battery replaceable? 3.4 Is the plastic of the helmet flexible? 3.5 Is the helmet always dark? 3.6 Can I adjust the helmet? No matter how expert you are at welding, you can never skip the necessity of personal protective equipment. 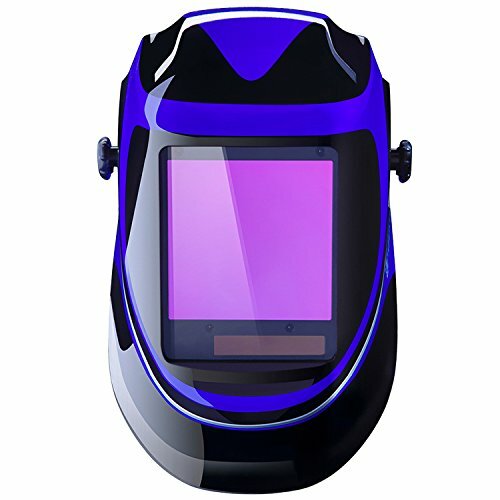 Welding helmet intends to protect your eyes and face from various hazards caused during the welding work. However, Dekopro has come up with a great product line of helmets and below we will focus on their top 4 safety tools. One of the best features of this tool is that the lens shade gets auto adjusted with the lighting of the working area. It is named as “Auto Darkening Filter.” It runs by a Lithium battery which is recognized as it’s an eco-friendly feature. The battery can also be charged through the solar panel. It is aimed at giving the best protection to your eyes. It comes with 3 buttons for delay time adjustment, sensitivity adjustment, and shade adjustment. There is also a low power alarm which will immediately notify the user when power is getting low. This tool enables the user to see clearly with a crystal visor area. The lens automatically gets adjusted with different angle and environment. This helmet is a lightweight tool suitable for a long time working. It also comes with an adjustable headband. The fittings can be adjusted from different angels and joints so that they fit you perfectly and you can continue the work comfortably. But be careful when you adjust the headband. If not set correctly, it will slip down while working causing fatal accidents. The price is also reasonable. It will cost you below $40. Compared to the price of other counterparts, it is a good deal. Of course, there will be some minimal differences with the expensive ones, but still, it is an excellent option within budget. Especially suitable for beginners who do not want to invest much. A large viewing area is critical for any kind of welding helmet. You will be happy to learn that this helmet comes with a wide 7 square inch viewing area. It does not obstacle your vision and enables you to focus on a large area. Welding work requires proper light balancing. This model has an auto-darkening filter which darkens the vision in less than a second. You are also allowed to manually control the functions. There is a sensitivity adjustment and delay adjustment button. Based on the working environment and work duration, visibility and color recognition can be enhanced according to your need. The viewing area is 3.85” * 3.15” which is adjustable to light diffusion and allows the user to see through different angles. It has 5000 hours battery life. Apart from that, it can be powered by solar energy also. So you need not to worry in case of electricity failure. The welder will still be protected from UV and radiations powered by solar panel. With a feature of the low battery indicator, you will be notified when power is getting low so that you can be prepared for alternative actions. The helmet is well protected with a mask shell. There are three headgear knobs attached with the helmet. It looks like a circular plastic wheel. You can just move it and adjust the size accordingly. The price range is between $70 to $80 which makes it not so cheap. The material looks easily breakable. This spectacular tool comes with an automated filter welding lens. There is a shade controlling knob through which the user can adjust the visibility from 9 to 13 degree according to the comfort of the user. The protective shield secures the welder’s eyes and face from UV, infrared ray and harmful lights. The auto darkening feature adjusts the light within a second to ensure work comfort. It comes with an adjustable headband which is controlled by 3 pins. You can adjust those pins according to your comfort. The pins are easily adjustable even wearing heavy hand gloves. As for the price, it can be purchased for below $30 which is a great deal according to the functionality of the helmet. Considering the money it takes, it is good enough to complete simple welding jobs. The auto darkening and shade adjustment features make it demandable if compared with the price. It is also featured with a solar panel which will enable you to work even if the electricity is down. It possesses most of the functionality that the expensive ones have. The vision area is approx. 3.62″* 1.65″ which helps the user to see appropriately without any obstacle. Also, it is very lightweight and appropriate for using in more extended hours. It can be used in a different working environment like construction, automobile, repair and operation, gas, mining, etc. So if you own this, it is generally expected that you can use it at any kind of environment. The unique feature of this tool is the LED digital display. Like a 3D HD movie, you can see the objects crystal clear. With the big lens, it allows a broader vision. Hence you can easily target your purpose and do the welding task precisely. Full shade color adjustment can be done to be more focused. Also, there are auto darkening features which start darkening in less than 1 second. The shade range can be adjusted between 9 to 13 degree. It met all the safety requirements and is certified as one of the safest options. If you care about safety and eye protection, this particular one can be your choice. None of the best things comes in cheaper. You have to count a good amount of money to purchase this one. It will cost you around 100 dollars and arrive with a lithium battery along with solar cells. So you do not need to depend on electricity only for charging the batteries. It can be used both for professional and household projects. You will find it capable of handling a massive infrastructure like construction, mining, military, metal production, manufacturing, etc. The helmet is lightweight and comfortable with a smooth surface. It can be tailored fit based on personal preference and comfort. The headband comes with a wheel like a knob. You can circulate the knob to adjust the size so that it fits properly. 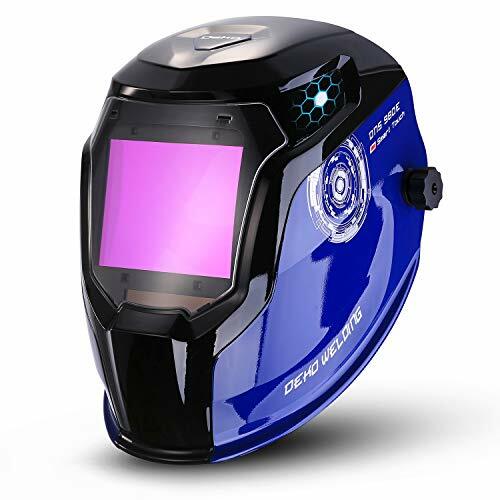 Auto-darkening protection is the newest feature added to the modern welding helmets. It automatically changes the shading from light to dark based on the environment. It is supported with quick changing LCD technology which darkens the view in milliseconds to protect your eyes from harmful light effusion. The conventional welding helmets had a traditional glass lens and fixed shade which remain darkened all the time. The welder has to lift the helmet every time to check the progress of the work. This continuous process often leads to neck pain if done for a more extended hour. An auto-darkening feature allows the user to work comfortably and check the work progress still putting on the helmet. Try to look for helmets with full coverage shell. The ultimate purpose of wearing a welding helmet is to protect your face from sparks and harmful rays. If it is unable to do so, there is no point of investing your money and risking life. You must check if your targeted welding helmet meets the minimum safety standard. In the United States, the safety standard is ANSI Z87.1, and in Canada, it is CSA Z94.3. So a welding helmet should meet any of the standards to ensure the safety of your precious eyes and face. Even if it costs more, you really should not take a risk with your safety. Delay control is the response time of the hood to change the darkening shading from dark to light. You should aim at the helmets on which you can set this delay control based on your work need. For small welding work, you might want immediate shade changing. But for more extended and critical welding it takes time to cool down the sparks. Hence you will need a bit longer response time. However, with this feature, you will be able to set the response time from 0.1 to 1 second. This feature is helpful for the welders as it allows them to move faster and work comfortably. Helmets which come with replaceable batteries are expected to function longer than the one with a non-replaceable battery. Those are predicted to have a 5-7 years’ service life. But with the replaceable battery, it works more than that. Welding helmets can be powered by a battery, solar or combine both. Solar panels are a great source of power, but often it cannot be replaced. So it wise to look for the combined power option. If you are out of electricity, you can use the solar also as a backup. Another useful feature is auto off setting. It will power off automatically when your helmet is not in action and saves the remaining power. It is a must to look for the lightweight helmets. No matter how expensive or modern the helmet is, if it weights heavier undoubtedly, you will not be able to use it in the long run. Even the difference of 1lb weight also matters a lot. If it weights’ heavier, you will feel discomfort and lose concentration on work. It will start with a neck strain, and in the long run, it can turn chronic if used regularly. The fitting of the helmet is a crucial consideration before buying any helmet. If the fitting is lost, your skin will be exposed to ultraviolet ray which might lead to fatal damage of your skin and eyesight. Hence you should go for a trial before buying. If you do not feel comfortable with the fitting, then do not go for it. Even if it costs more to get a well fitted one, you should buy that. Safety comes first, no matter how much you are spending on that. How do you charge when the battery is low? Most of the batteries come with electricity powered and solar powered option. So you can try any of them. Just plug in the battery with electricity, it will be charged. Or just hold the battery in front of sunlight or light bulb, it will be charged. Where can I get replacement lenses? If you have any problem with the lenses or any other tool of the helmet, just contact the manufacturer at support@dekotools.com, they will send you a replacement. Is the lithium battery replaceable? Yes, the battery unit is not sealed. So you can access there and replace the battery if needed. Is the plastic of the helmet flexible? Yes, the plastic of the helmet is flexible. Which means if it falls or gets hit, it will not break easily. Is the helmet always dark? No, it has a unique feature of auto-darkening. Usually, the lens will be transparent. But once you start welding, it will automatically darken the view to protect your eyes and bring comfort. Can I adjust the helmet? Yes. There are more than one adjusting knobs attached to the helmet. According to your comfort, you can adjust the fitting from different angles. Welding helmets are now more functional than ever with all the modern features. 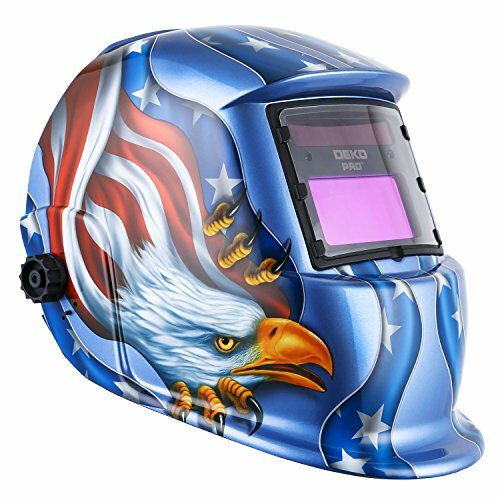 Dekopro welding helmets are offering a variety of ranges with different functionality and price. According to your work need and budget, you can choose any of them for your welding tasks. Hope the review will help make your purchase decision!